Nothing. It’s too late to fix. This is a question from PRSA’s updated version of the Ethics Quiz – read on to see if you answered correctly and if you had the same reasoning. 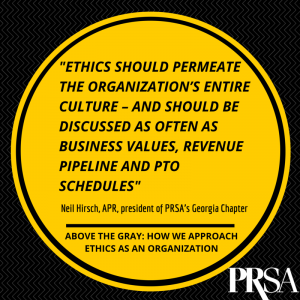 Throughout September, PRSA hosted nationally a month of activities in recognition of Ethics Awareness Month. But like anything with a designated time of “awareness,” it shouldn’t mean we relegate the focus and conversation only to those days or weeks. Ethics in our industry, more than anything else, is truly a 24/7/365 commitment. The rise of digital communications and social media – in general, the Internet of everything – has created a host of ambiguities which cause even the most principled among us to vacillate. The challenge comes in operating in the gray zone – ethical decisions are not always simple nor is there always a clearly “right” answer. An organization’s strong ethical culture provides a foundation to stand strong, no matter how conflicting the winds of change. Establish a Code of Ethics for employees to use as a guide for behavior and self-management. Champion ethics training for new employees and annually organization-wide to translate theory into practice. Make sure internal communications reinforce ethics guidelines and celebrate examples of ethical behavior. Identify an internal or external ombudsman to serve as a resource for employees as they face ethical challenges. Uphold anonymity. Moral awareness to understand when a problem starts to have a dimension of right and wrong. Moral reasoning to be able to think through the problem, project the consequences, then decide what to do within the deep complexities of an issue. Moral courage to overcome the fear of an ethical answer that is not easy to implement. Moral effectiveness to positively persuade someone else to choose the most ethical action. As public relations professionals, we are in a unique position of influencing decisions not only for our team, but for our clients or organizations. How do we make sure our ethical center is strong enough for the both of us? It starts with a solid understanding of our professionals’ ethical standards and values. The answer to the earlier question is D: Both B & C. PRSA states: Even though the mistake was unintentional and correcting this information may prove embarrassing to the executive, failure to promptly correct erroneous information delivered to the news media would not be in keeping with the PRSA Code of Ethics professional values of Advocacy, Honesty, Independence and Fairness. It’s really worth the three minutes it takes to run through the Ethics Quiz. You may be surprised by a couple of the answers —and perhaps you’ll be better prepared the next time you face an ethical challenge. Neil Hirsch, APR, is president of PRSA’s Georgia Chapter and global external communications manager of Novelis.